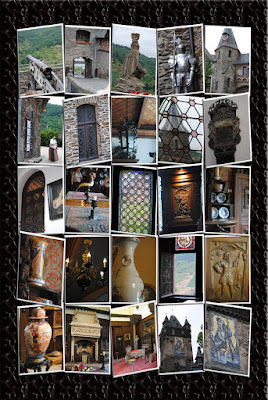 The Cochem Castle, or Reichsburg Cochem in German, is a place where history comes to life. 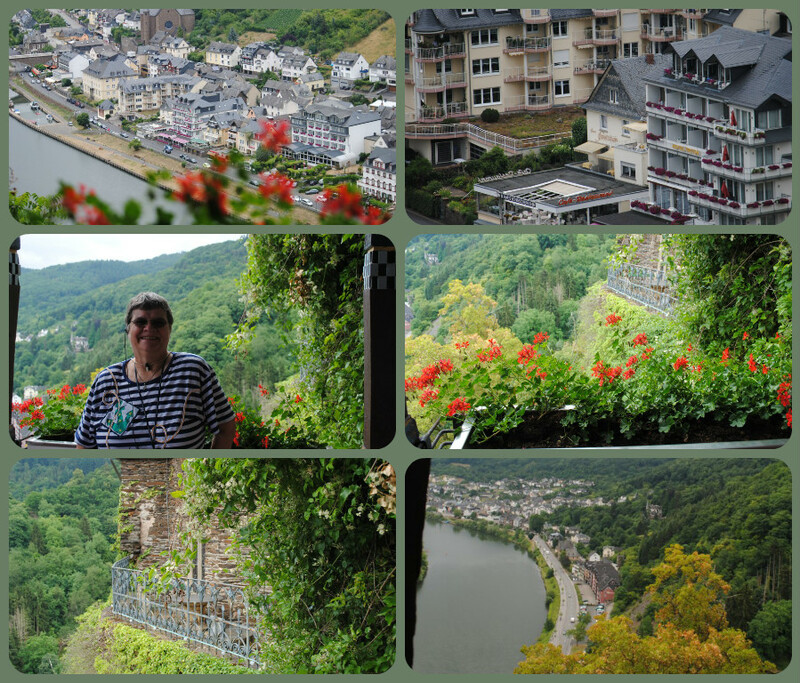 The castle we see today towering above the scenic town of Cochem on the Moselle River is not the castle that originally stood there in the 12th century. That castle had a long and colorful history until French King Louis XIV had his troops obliterate it in 1689. Cochem Castle dates back to the first millennium, the year 1000 A.D. It was the home of the Palatinate counts and was built on the orders of Count Ezzo. The first historical mention of this castle is from 1051, when it was given as a gift to a nephew, Henry I by Richeza, the oldest daughter of Ezzo and one-time Queen of Poland. 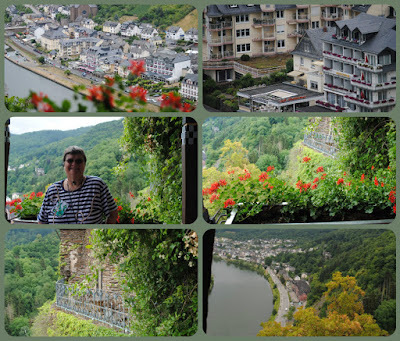 The castle sits perched upon a 100 m (328 ft) hill overlooking the River Moselle. We took a shuttle bus to the castle summit where we were then met by a local guide for a tour of the interior of the castle. 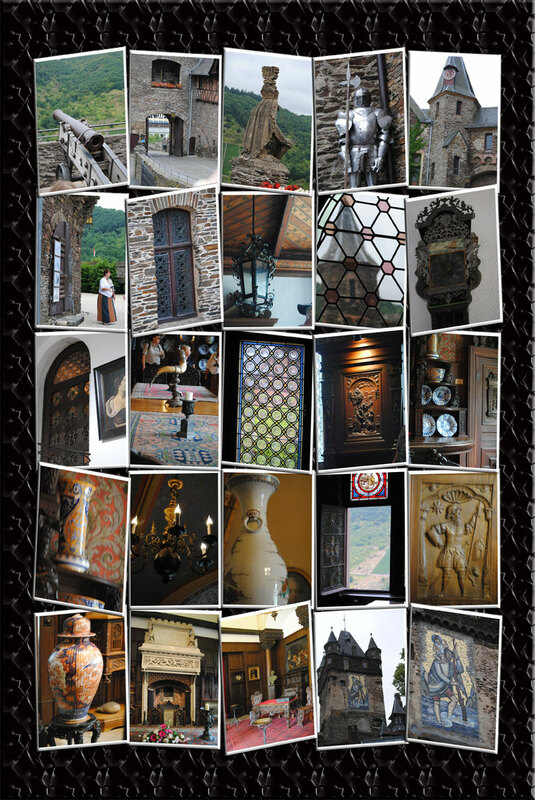 Qualified guides will show you the most beautiful rooms and make you familiar with the history of Cochem Castle. Since we were part of a large group, there was a pre-assigned time for us to be at the castle. We still had to wait for our group number to be called before beginning the interior tour. Just before the conclusion of the tour, we were treated to an amazing view from the terrace of the castle. From this vantage point you can see the winding river, and the town below. 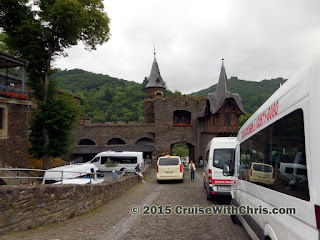 Our visit to Cochem was on day eight of our 13-day river cruise on Avalon Artistry II. If you are just joining us, be sure to review our previous posts. International Internet Day is celebrated worldwide, every year on 29th of October. 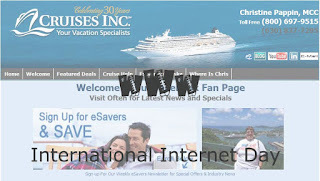 Since the year 2005, the International Internet Day has been famously celebrated to commemorate a momentous day, in 1969, in the history of telecommunications and technology. This was the event of the sending of the first electronic message which was transferred from one computer to another on October 29th that year. Why don’t you start your celebration of Internet Day by visiting the original website, which just so happens to still be online. Contrast that to websites today. The Internet is everywhere these days, being accessed on phones and tablets, tied into our cameras and our TV’s. Wi-Fi is accessible from everywhere these days, from city buses to your neighborhood restaurant, and even at sea on cruise ships. The world grows smaller every day as a result. Internet Day is a celebration of this culmination of computing and communication technology, and they way it has brought all our lives together. 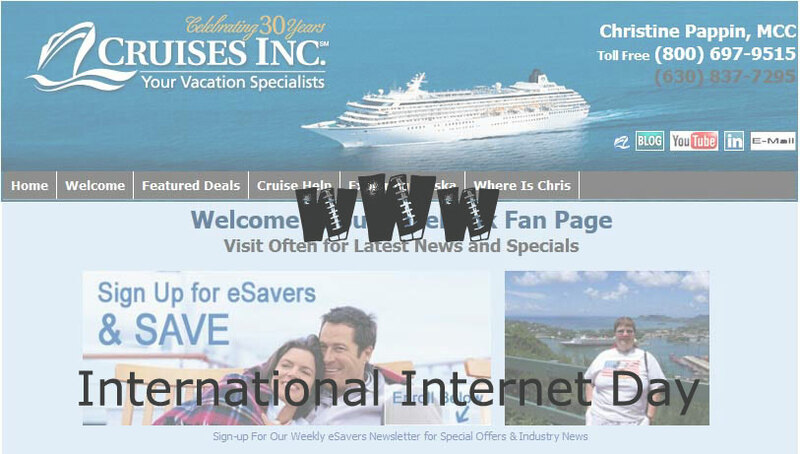 Perhaps the biggest challenge for Cruise Lines today is meeting the demands for passenger and crew on existing internet resources. Passengers are looking for faster and less expensive ways to stay in contact with friends and family while on vacation. Several Cruise Lines have announced or adopted changes to address the growing demand of their customers and staff. 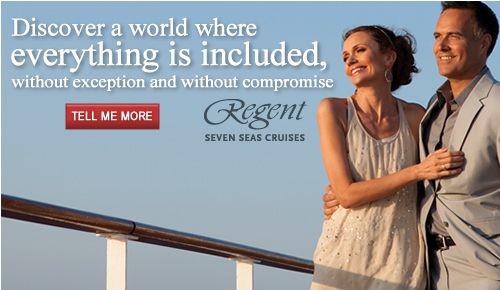 Luxury Cruise Lines such as Regent, Crystal, and Oceania, have introduced Free Internet Access to a select group of passengers (such as certain suite guests). Other lines, like Royal Caribbean are looking to increase speeds and offer multiple programs which can be purchased depending on your needs. So, if you are planning a cruise vacation, don't leave your electronic gadgets at home. Whether on the ship or at a local internet cafe while in port, you'll have plenty of opportunity to stay connected with friends and family if you want to. The ancient and romantic town of Cochem is situated in the most beautiful part of the Moselle Valley. While strolling through the town, prior to heading up to Reichsburg Castle, we noticed St. Martin Church in the heart of the market area. From the exterior, one could tell that there were some amazing stained glass windows decorating the church. While I returned to the ship, my husband walked back to the church and captured some images of the interior. We hope that you enjoy these images. 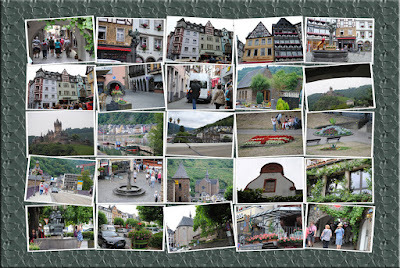 We'd highly recommend including the interior of the church to your visit of Cochem. This church is one of the three Roman Catholic churches built inside the city. The church is situated by the market. The church has a turbulent history. The current old choir stand was first mentioned in 1593. Between 1932-1933 a new nave was built, but it was destroyed by bombing in 1945. In 1950/1951 the nave was rebuilt again. The interior of the church is quite plain, with the exception of these magnificent statues and stained glass windows. Following our morning walking excursion to Cochem, including the visit to the Reichsburg Castle, it was time to board our ship for one of the highlights of the week. 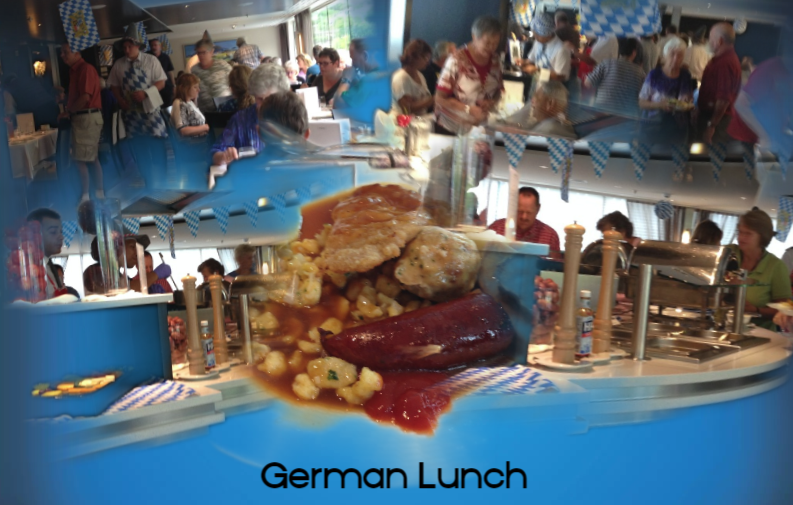 The restaurant was converted into a German "Brauhaus" with music, dressed waiters, and German specialties for lunch. 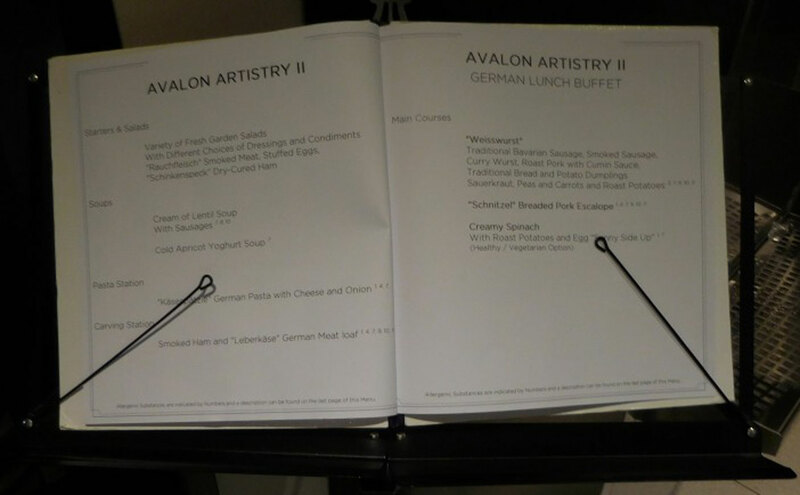 The lunch menu included salad selections, two soups, German pasta and meatloaf, various German sausages, roast pork, Schnitzel, bread and potato dumplings, sauerkraut, peas and carrots, and roast potatoes. Click on the menu for more details. When everyone was on board and enjoying lunch, the ship sailed for Koblenz, Germany. We arrived there shortly before dinner and would be docked there overnight. You could disembark the ship to go for a walk if you liked. Hurricane Patricia made landfall at the speed of 165 MPH and then quickly began to weaken. Early reports indicated that it would not be as catastrophic as predicted, fortunately. We have gotten word that AM Resorts and the airport in Puerto Vallarta has reopened for example, so that is very good news. The largest hurricane to ever assault the Western Hemisphere headed toward Mexico’s southwest Pacific coast on Friday with 200 MPH winds. Patricia was expected to make landfall by early evening, according to Mexico’s national weather service, with the eye passing along the small beach towns of Playa Perula and Playa Chamela, both in the state of Jalisco. The government of Mexico declared a state of emergency in dozens of municipalities in the states of Colima, Nayarit and Jalisco. Hurricane Patricia is expected to remain a Category 5 hurricane until landfall in southwestern Mexico in a few hours. After landfall, a combination of the mountainous terrain of Mexico and increasing shear should cause the cyclone to rapidly weaken, with the system likely to dissipate completely after 36 hours, if not sooner. ship will return to Los Angeles Sunday, October 25, as scheduled. storm conditions are spreading across portions of the warning area. watch area this afternoon and this evening. 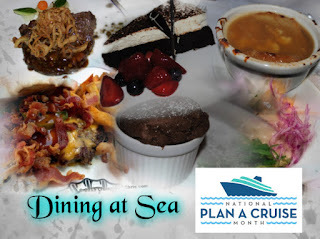 In honor of National Plan a Cruise Month let's take a look at dining at sea. Depending on your food requirements, you may select one cruise line or itinerary over another. Whether you have cruised before or not, I'm sure you are aware that there's plenty of great food to be had on a cruise ship. The first thing you'll find when you get onboard is that your cabin is not ready, but don't worry, the buffet is open and ready to serve you. But that is just the beginning of what lies ahead. 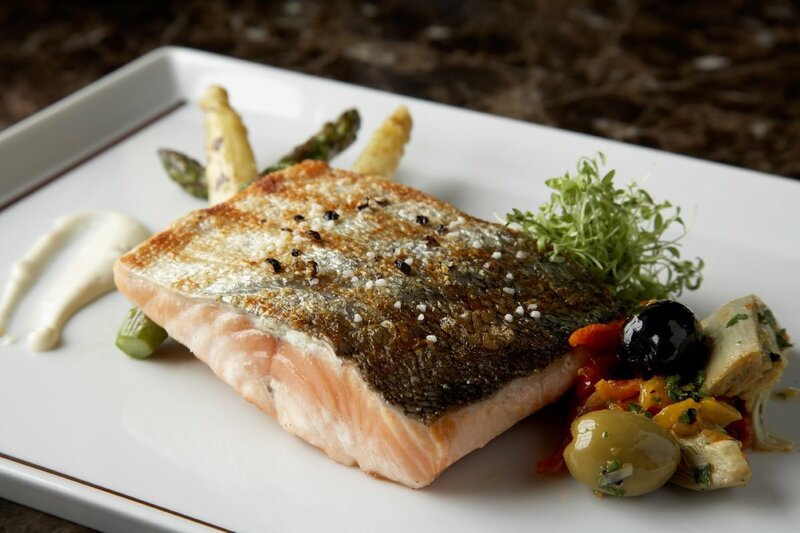 We'll take you on a culinary journey onboard several cruise ships over several posts. If you can't wait, we've posted some similar stories previously as well. While it is true that there are several dining options on every cruise, we've examined this myth about nothing to do but eat previously. Now, let's focus on the second part of that myth - that you'll gain weight. 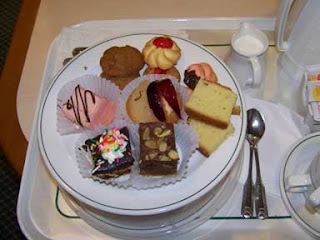 It is possible that you could gain weight on a cruise, but if so, that will not be the cruise line's fault. There are healthy menu options on the main dining menus and while not every venue serves food for the health conscious, there are plenty of options for you to chose from. In addition, there are full service health and fitness facilities on each ship so that you can continue your exercise routine. One of the things the cruise line pays close attention to are any dietary requirements of their passengers. We took this picture during a galley tour on Azamara Journey. The special requests consist of some religious requests, because it was during Jewish holidays, and also some specific ingredients that needed to be avoided for another passenger. Be sure to let you cruise specialist know if you do have any special requirements so that it can be noted on your reservation and advance preparations can be made if necessary. In addition, visit our Pinterest Board where we'll be sampling some of the food and venues that we've had the pleasure of dining at in the past. 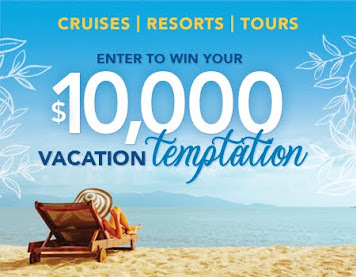 When you think of a cruise, what's the first thing that comes to mind? We are betting one of your first thoughts includes eating some great food - and perhaps a lot of it during your cruise vacation. 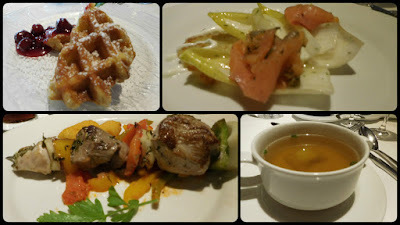 Cruising is all about choices, and when it comes to food, the cruise lines have taken things up a notch or so lately. Do you eat dinner at home at the same time every night? Do you eat early or late? 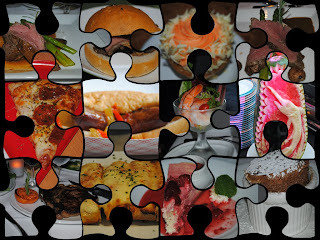 When you go out for dinner do you like fast food, buffets, or fine dining? Perhaps you like all three? 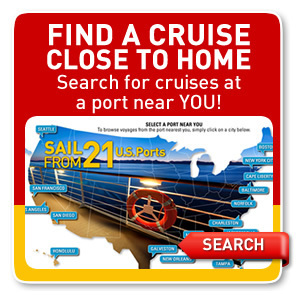 When booking your cruise, you'll be able to make some of the same choices that you do at home. The choices vary by cruise line and ship. Let's take a look at some of the choices. At the time of booking, you select early or late dining and the table size that suits your style. Every night you have a table waiting for you in the main dining room with the same dining staff waiting there to serve you. The meal consists of several courses with a menu that typically changes each night. Often there is a theme to the menu. Select one or more appetizer, soup or salad, your main course, and your dessert. Can't make up your mind? No problem, select as many as you want. With this form of dining, your wait staff gets to know you, your likes, and dislikes. Imagine sitting down for dinner and not even having to ask for the glass of ice tea that you like to have with your meal. You may also make some new friends with passengers if you select a larger table size. 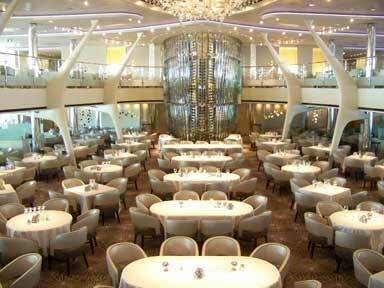 A variation of traditional dining is open seating which has different names depending on the cruise line. With this arrangement, you don't select a dining time in advance and are not assigned a table. A portion of the main dining room, or perhaps the entire dining room is devoted to this option. The menu is the same as with the traditional dining consisting of several courses. You arrive at the dining room during specified times, and tell the&maître d’ about your dining preferences, such as table size. The main difference between this and traditional dining is that you won't have the same wait staff and most likely will be dining with different passengers if you select a larger table size than your party. If you find wait staff that you really like, you can request to be seated in their section, so this can be a hybrid of traditional dining if you request it. 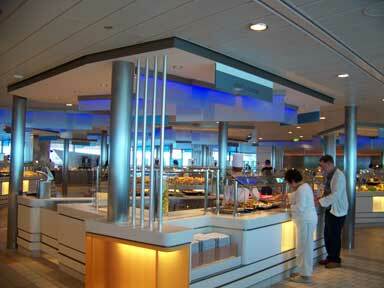 For those that want a more casual dinner experience, you can select cafeteria style dining in the ship's buffet. Here you can select from several different serving stations and return as many times as you like for more food. Arrive any time you want during specified dining hours and stay as long as you like. On some ships, there may also be an alternative dining option in the buffet where you still make reservations. This can be a great option if you return to the ship late from a shore excursion and just want to quickly dine before starting your evening entertainment. Some ships have dining venues that require reservations and offer an upscale dining experience much like fine dining back home. 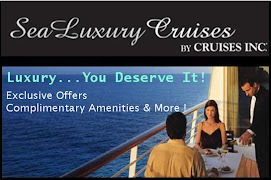 There is an additional gratuity charged to your onboard account for the special service provided. 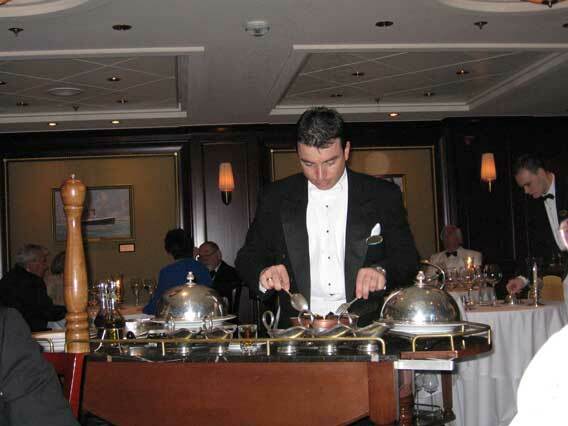 On some ships, there may only be one specialty restaurant while on others, there may be several specialty options. The specialty cuisine might include steaks, chops, seafood, Italian, Asian, Japanese and other cultural dishes. Often the dinner is served with a flair, such as flaming entrées and desserts made table side with the food be presented at once to the entire table. Expect to be dining for several hours in most specialty restaurants. 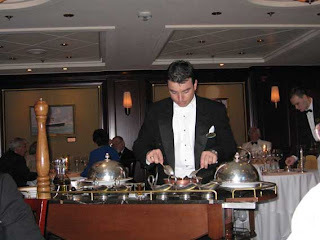 This is an optional dining experience that you may want to incorporate into your cruise, especially if you are celebrating a special occasion during the cruise. Don't feel like leaving your cabin tonight? Pick up the phone and phone in your order. 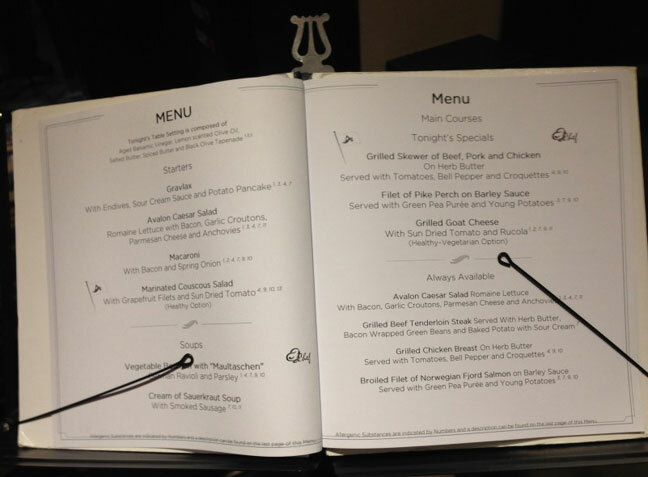 You can select from the same dinner options that you would have in the main dining room. 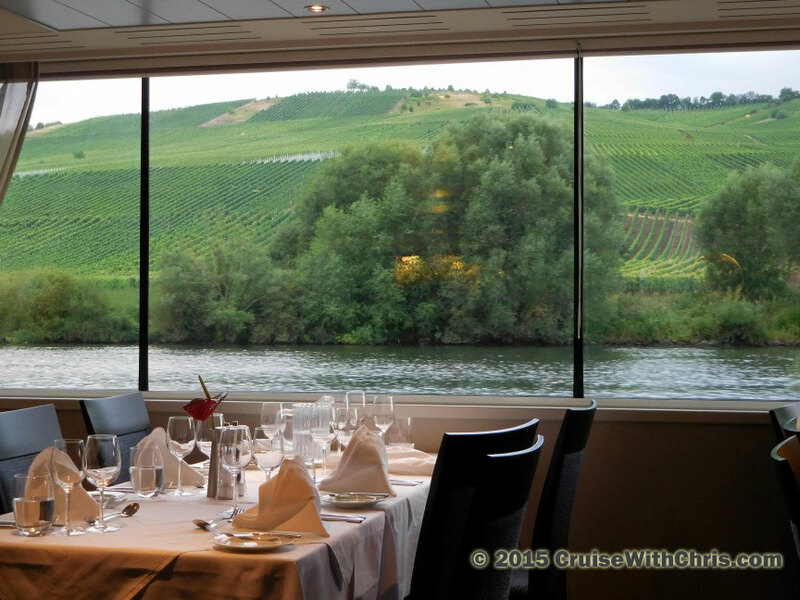 Imagine a romantic dinner on your balcony as you sail to your next port of call. On most ships, room service is included in the price of your cruise and available 24 hours a day. Some ships have recently added a surcharge for late night dining due to the unfortunate waste of food they have been experiencing from guests that probably need coffee instead of food. You return to the ship from a fun day in port and you just don't feel like a sit down meal. Instead, you have a taste for your favorite comfort food like pizza or burgers. Many ships offer pizza all day long and some have even added specialty burger restaurants, such as Johnny Rockets, where you can get a burger and fries complete with your favorite flavor milk shake. Don't forget some soft-serve ice cream to put the finishing touches on your comfort meal. You'll typically find these dining options near the main pool area or the promenade on ships that have them. In some cases, there may be an extra charge, but many are included in your cruise price. Regardless of the dining option you select at the time of booking, you'll find several dining options available once you are onboard. Just like you might at home, there are nights when you want a fancy meal and others where you are quite content to have a slice of pizza and your favorite beverage. In recent years, the cruise lines have begun to add more and more options to their dining repertoire. Guests have told the cruise lines that while on vacation they don't want to be told what to wear, when to eat, and where to eat. The cruise lines have listened. Norwegian Cruise Line introduced "Freestyle Dining" over 14 years ago and have continued to refine the program. One thing you need to realize is that you will be paying the surcharges we mentioned for specialty restaurants for the freedom of choice. The fees won't break the bank, but you need to include them in your vacation budget. We've written about Freestyle Dining many times before - just do a search to read more. You don't need to eat at the same restaurant every night of your cruise, unless you want to. Try some of the alternative dining options on your next cruise - you may find a new favorite. Also, this is a good place to try new foods. The waiter will be glad to bring you something else if you don't like your first choice. 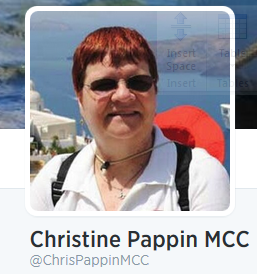 For those of you that don't know #FriFotos was a weekly photo forum by @EpsteinTravels @TravelDesigned @CharlesYap. Theme was revealed every Tuesday 12pm ET. Recently, @spencerspellman joined the team as a permanent co-host. We co-hosted one week late last year and continued to contribute with images from our archives whenever possible. This Friday marks the end of an era. For five years, the Twitter community has gathered each Friday to share photos related to a stated theme. 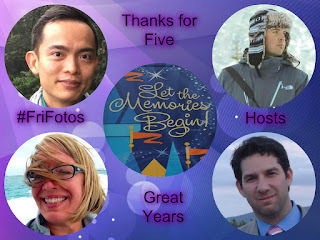 Three weeks ago, Jonathan Epstein, one of the hosts, announced that on the fifth anniversary, #FriFotos would be discontinued. He also announced the themes for the final weeks. This is a fitting theme as we look back on #FriFotos history. 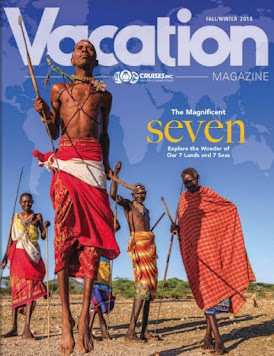 One of the things we loved about #FriFotos was that as each theme was announced, it would trigger our review of our photo archive for images that would fit the theme. In many cases, we also had blog posts that accompanied the images, which also helped us to relive our memories. 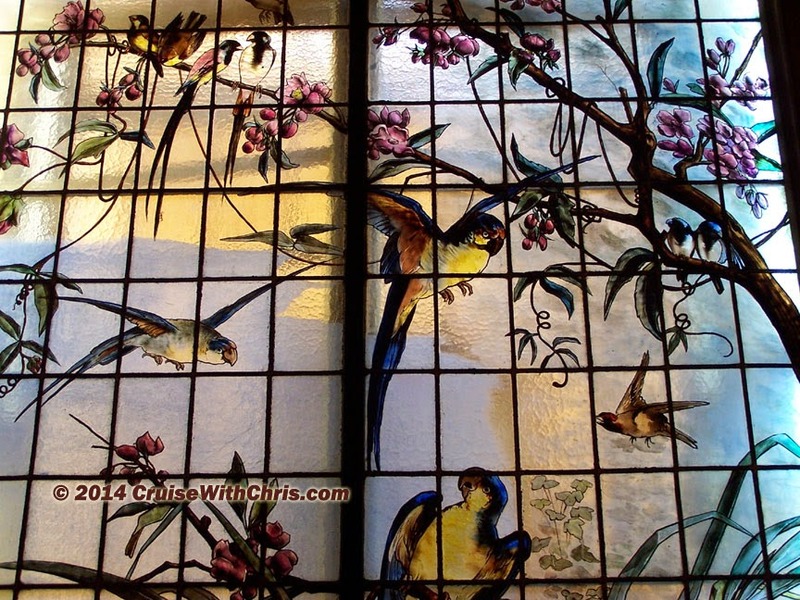 The happy #Memory for us was when we were invited to co-host #FriFotos #GreatIndoors theme. Join us this Friday for the Final time as we join as an online community sharing images that relate to the #Memories topic. Thank you Charles, Jonathan, Stephanie, and Spencer for all the hard work to make #FriFotos such a success. Thank you to guest co-hosts as well and to all that contributed. Truly this was a labor of love. We are saddened to see #FriFotos end because it always gave us something to look forward to as the week drew to a close. We've made a few friends along the way and hopefully that won't end as #FriFotos packs up after the final Friday. 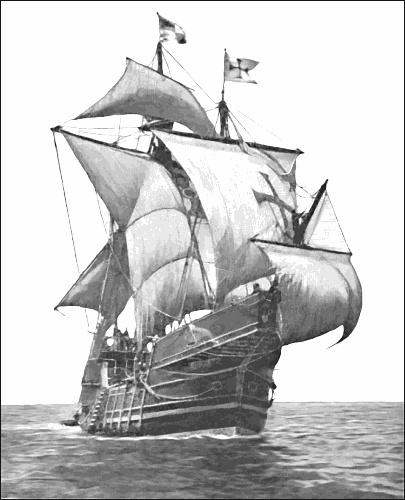 The Pinta was square rigged and smaller than the Santa María. the ship weighed approximately 60 tons with an estimated deck length of 17 meters (56 ft) and a width of 5.36 meters (17.6 ft). The crew size was 26 men under Captain Martín Alonso Pinzón. On the evening of 3 August 1492, Columbus departed from Spain with three ships, including the Pinta. He first sailed to the Canary Islands where he stopped for repairs and provisions, staying there until 6 September 1492. In the wee hours of 12 October 1492, Columbus claims to have seen the light of land. Columbus called the island (in what is now The Bahamas) San Salvador. He claimed the lifetime pension promised by Ferdinand and Isabella in connection with the sighting. Oasis of the Seas is 47 meters wide and 360 meters long, i.e. 40 m longer than the height of the Eiffel tower! Height over the water line is 65 m. Building the vessel has been compared to a huge 3-dimensional puzzle. The vessel consists of 180 grand blocks, the biggest with a size of length 22 m, width 30 m and weight 600 tons! The vessel´s weight is 12 times the weight of the Eiffel tower. 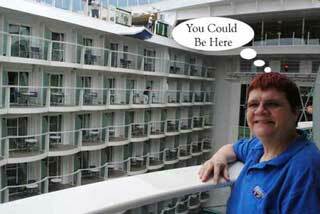 Here you see just one of the 180 grand blocks that comprised the Oasis of the Seas. Let's assume that it's the largest block. That would mean that the Pinta was 5m shorter and 1/10th the weight of just that one building block. Just like the Pinta, the Captain of the Oasis of the Seas set sail from Europe destined for Bahamas and points beyond. The Oasis made the journey from 31 October 2009 until 13 November 2009, arriving two days later than planned due to a tropical storm it encountered during the crossing. Columbus too had encountered tropical weather during his crossing. Columbus would probably be amazed if he sailed his ship alongside the Oasis of the Seas. We'll take a look at more ships as we continue our special series for National Plan a CruiseMonth. 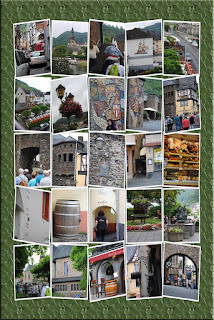 Avalon Artistry II sailed into Cochem, Germany around 8 AM while we were finishing our breakfast. 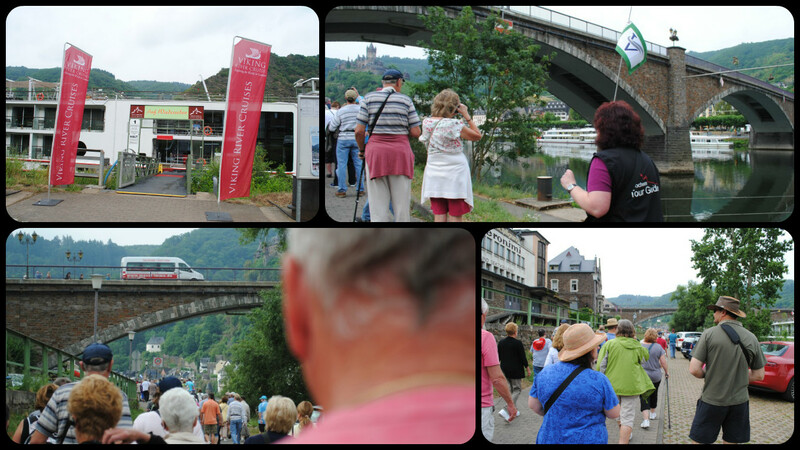 Our included excursion met at 9 AM for a walking tour through Cochem. Our guide met us at the dock and began by describing the surrounding area. On Monday mornings the shops open around 10 AM. Highlights of this delightful little village include little museums like the mustard mill, art gallery shops, and wine shops. Our walking tour took us to the old quarter of town. In the bustling old quarter of Cochem, the timber-framed houses, the market square with its baroque town hall and Martins-Brunnen, St. Martin's Church and the former Capuchin monastery (now an arts centre) have been well preserved and lovingly restored. Sections of the old town walls have also been well maintained, including the historical Enderttor, Mäusetor and Balduinstor town gates. The Cochem tourist office has maps and more information. After concluding our tour of this part of town, we had a short mini-bus ride to Reichsburg Castle which we will cover in a separate post. We've taken many pictures of cruise ships over the years and perhaps none was as striking as this image we captured in Cozumel, Mexico, during our National Conference aboard Norwegian Epic. Shown here are two Royal Caribbean ships: Grandeur of the Seas and Oasis of the Seas. Captains Zini and Wright had something to say about it amongst themselves. That story was picked up by the media and has become one of the talking points about the two ships. We published this picture and details before, but it is worth repeating. 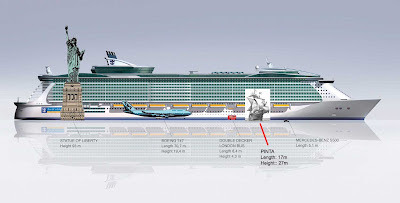 Click on the image to really get an idea of scale of both Oasis of the Seas and Allure of the Seas. Oasis of the Seas is 47 metres wide and 360 metres long, i.e. 40 m longer than the height of the Eiffel tower! 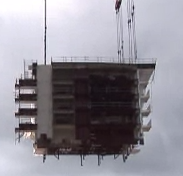 Height over the water line is 65 m. Building the vessel has been compared to a huge 3-dimensional puzzle. The vessel consists of 180 grand blocks, the biggest with a size of length 22 m, width 30 m and weight 600 tons! The vessel´s weight is 12 times the weight of the Eiffel tower. The Statue of Liberty does tower over the ship but you could put several Boeing 747s, London Double Decker buses and Mercedes Benz autos end to end and have room to spare. Just to give you an additional sense of scale, the first cruise ship we went on in the 80s was Carnival Celebration which weighed in around 37,500 tons. At the time, that was one of the largest vessels in Carnival Cruise Line's fleet. The Oasis and Allure are almost 6 times heavier than the Celebration. 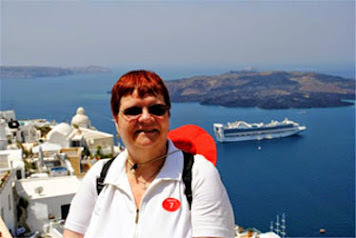 If you have been following our blog, you are well aware of all the activities on Oasis and Allure. Size is obviously an advantage to ship builders - they have more canvas on which to create. So with the introduction of these ships, we have some of the most amazing innovations at sea. Of course, size costs more. The price tag of these state of the art vessels means someone has to pay for the ship. 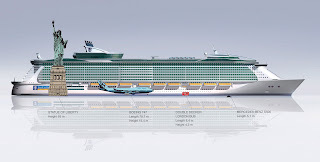 The good news is there are more cabins on a large ship which means more passengers to share the weekly costs. It does however mean that, at least for the foreseeable future, guests will pay a premium over smaller ships owned by the same companies. More passengers can mean more wait time, but Royal Caribbean has taken that to heart in planning these ships, and you might not experience long wait times. There are so many different attractions onboard, passengers will be scattered over the entire vessel, so it shouldn't appear crowded most of the time. Loading and unloading the ship will be one time where you'll see most of your fellow passengers, but Royal Caribbean has taken steps to make that run smoothly. We have focused on Royal Caribbean in this article, but there are other examples within the remaining cruise lines. One important take away is that size is just one factor when planning your cruise vacation, but it is an important one. Take advantage of the expertise among cruise specialists in deciding the right ship for you and your traveling partners. The last thing you'd want would be to be expecting a ship the size of Grandeur of the Seas and step out of your cab to find Oasis of the Seas in front of you at the pier. No matter what size you are looking for, you'll find a ship in one of the cruise line's fleets that meets your needs. They come in many sizes, shapes, and with many different attractions. Personally, the fun is in selecting the ship you want to try next and enjoying everything it has to offer once you start your cruise vacation. Cruise lines are offering special promotions and pricing on popular cruises to encourage consumers to plan their next cruise vacation now. 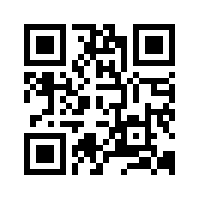 We'll be featuring promotions on our website and social media. Click here to see current offers. Once again, our ship moved from where we last left it in Grevemmacher around 1:30 PM. Since Luxembourg excursion was optional, not all passengers disembarked after lunch. 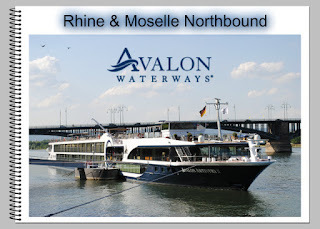 Those that stayed onboard got several hours of extra cruising along the Moselle river. Artistry II made a technical stop in the village of Riol to pickup passengers who had been on the Luxembourg excursion. We had some time before dinner to enjoy the view from our cabin. 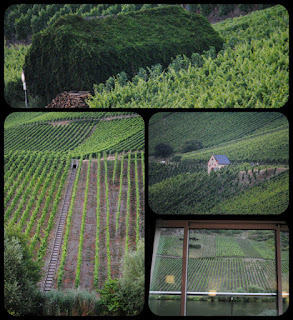 As you can see from both pictures, this is wine country and vineyard after vineyard lined the river banks. After our usual Port Talk by Mark, our Cruise Director, it was time for dinner in the main dining room. We had a lovely view of the vineyards along our route. The main entree choice that we selected was Grilled Skewer of Beef, Pork, and Chicken. 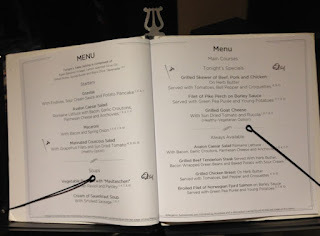 This wasn't your typical dinner selection on most cruises we've been on previously. It was excellent, by the way..
Click on the menu to the left to see alternative choices as well as more details about our meal. 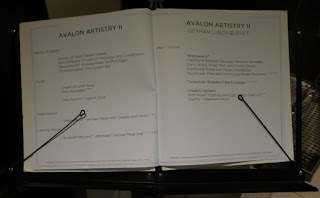 As usual, there were two soup choices and several other starter choices. We completed our meal with a Belgian waffle accompanied by berries. Note: you can order this off the breakfast menu as well - highly recommended.